Maybe you clicked on this because, like me, you are a sci-fi aficionado and you are already picturing a universe where an Artificial Intelligence has taken over the planet. In the video interview at th e end of this post, Dr. Ryan Dopps, Dopps Chiropractic NE, discuss the difference artificial intelligence like Siri or Alexa, and living beings. Siri can understand language, even garbled by a three-year-old. Siri can change the music while you are cooking, even type out a text and send it while you are driving. But in the end, Siri is just a program that can execute certain commands. It doesn’t think, it doesn’t do things on its own. It’s quite a different thing when we start talking about living, breathing beings. For example, I am 26 weeks pregnant with my fourth child right now. In the interview, Dr. Ryan asked me what I specifically did today for the growth and development of my child. The answer is nothing! My body knows what to do to help and support my tiny son’s body as each cell grows into the exact tissue, bone or organ needed. This is what we call innate or inborn intelligence. Dr. Ryan discussed that our brain can have both artificial and innate functions. We can learn things, on top of our innate knowledge. My baby will be born knowing how to breathe, how to cry, how to eat. But he probably won’t be born knowing how to do calculus. I don’t even know how to do calculus! So even though I don’t need to think through all of the stages of development that my child needs for this period, including a myelin sheath on his nerves, through the intelligence and education that I have gained, I can eat well and exercise to support health in my child. Dr. Ryan quoted B.J. 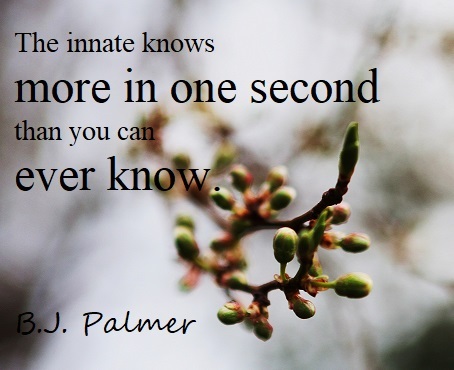 Palmer, “The innate knows more in one second than you can ever know.” He applied this to a child with a fever. Where artificial intelligence or modern education may say the child needs to be given medication, the child’s body innately knows that a fever is the best course of action bring balance and rid itself of whatever bacteria/virus is making it sick. As Dr. Ryan said, even if his office’s spiffy new computer program fails, it doesn’t interfere with his hands ability to find out of place vertebrae and adjust them back into place. We can get wrapped up in exciting technological advances, but the ultimate intelligence is right there inside each of us. If you would like to see how chiropractic can remove blockages to get your innate intelligence flowing, call or visit Dopps Chiropractic NE, Wichita.